Scott Gossman is proud to make "hard use cutting tools." This Polaris Bushcraft knife is an excellent example of this philosophy, all function and looks good too. Features a full-tang 4-inch drop point CPM 154 high carbon powder metallurgy stainless steel blade. It is 8.5 inched overall lnegth with Micarta scales. 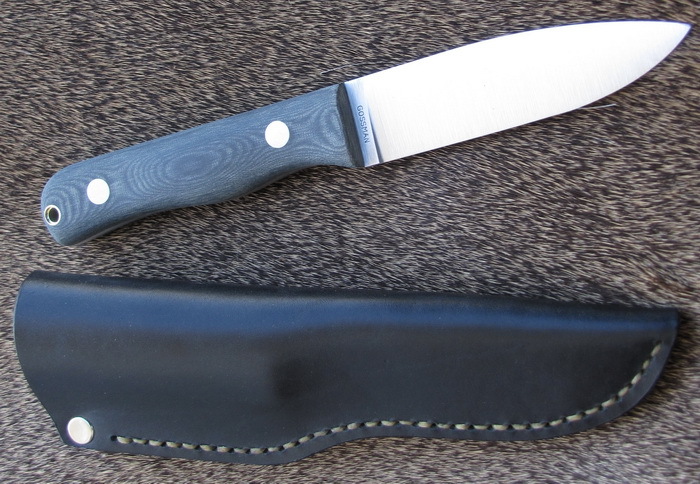 A leather sheath is included. My name is Scott Gossman. I am the owner of Gossman Knives. I make knives for wilderness survival experts, military personal, big game hunters and outdoor enthusiasts. I work with carbon tools steels such as A2, O1, S7. Also CPM steels such as CPM 3V, CPM 4V, CPM 154, CPM S35VN. I occasionally use simple steels such as 1095 and 80 CRV2. I strickly use micarta for handle scales because of it’s durability for hard use. I no longer accept custom orders. I make knives ready for purchase in my online store.